Cover: Eunice Martin School on Lincoln Road. 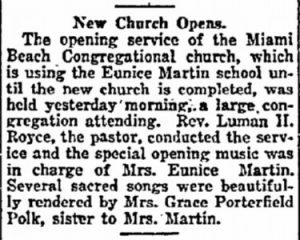 On January 4, 1920, the first service of the Miami Beach Congregational Church was conducted at the Eunice Martin School on Lincoln Road. There were 38 people in attendance for this service. The school was built in 1919 by Carl Fisher and leased to Eunice Martin. Martin had run a private school in Indianapolis, Indiana, prior to her arrival on Miami Beach. The original location of the school was at the northwest corner of Lincoln Road and Jefferson Avenue. The school building was moved in the mid-1920s to 1673 Michigan Avenue. After constructing his seven story office building on Lincoln Road in 1924, Carl Fisher believed that Lincoln Road should be a high class shopping corridor. He didn’t feel that the road was an appropriate location for a school. Figure 1: Miami Herald article on January 5, 1920. The first service featured a sermon by Rev. Luman Royce. There was also a special musical opening conducted by Eunice Martin. Services at the school building were only temporary for the church. The congregation was waiting for its permanent home to open at 1620 Drexel Avenue. It is now called the Miami Beach Community Church. The Eunice Martin School was acquired by a civic organization named the “Committee of One Hundred” in 1932. It used the building as its headquarters from 1932 to 1951. It added an auditorium in 1938. The addition was designed by August Geiger. The City of Miami Beach purchased the building in 1951. The building was demolished by the city to make room for a parking lot. Read more information at “Lost Miami Beach” by Carolyn Klepser (pages 104-105). Cover: Eunice Martin School on Lincoln Road. Courtesy of HistoryMiami. Figure 1: Article about the first church service. Courtesy of Miami Herald.